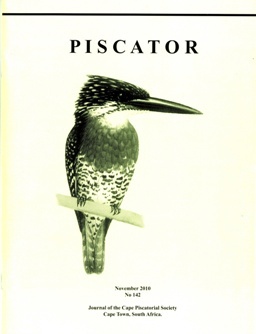 Ed Herbst writes: Since the first issue of Piscator was published in March 1947, it has carried articles which celebrated the joy of fly fishing rather than concentrating on its technical aspects. One of the most prolific contributors in this regard has been Garrett Evans. A compendium of his Piscator articles was published under the title of ‘Huckleberry Days: A Trouting, Shooting and Fishing Life’ . He asked me to write the foreword to the book, a copy of which is in the library. Another prolific contributor was the late Lawrie Kingma who wrote some lyrical articles on the early days when the Berg and Breede Rivers provided outstanding bass fishing. Down the years there have been many such articles which will be added to this website.